KippsDeSanto & Co. is pleased to announce the sale of its client, Systron Donner Inertial, Inc. (“SDI” or the “Company”), a portfolio company of The Carlyle Group, PAI Partners, and Schneider Electric, to investment affiliates of Resilience Capital Partners. Headquartered in Concord, CA, SDI is a leader in the inertial sensors industry, with considerable domain expertise in the design and development of high performance, precision, quartz microelectromechanical systems (“QMEMS”). SDI’s QMEMS are utilized in guidance, navigation, control, and stabilization applications for various aircraft, unmanned autonomous vehicles, land vehicles, and precision guided weapons. QMEMS provides clear, continuously improving size, weight, power and cost (“SWaP-C”) advantages over alternative technologies. The Company’s product portfolio, anchored by its flagship SDI500 inertial sensor, includes a range of highly accurate, reliable, and resilient instruments used in many notable strategic platforms, including the Boeing 777x, MK48 / MK54 torpedoes, business jets, and military aviation and guided munitions programs. About KippsDeSanto & Co. KippsDeSanto & Co. is the largest independent investment banking firm exclusively focused on serving leading, growth-oriented Aerospace/Defense, Government Services and Technology companies. We are focused on delivering exceptional M&A and Financing transaction results to our clients via leveraging our scale, creativity and industry experience. We help market leaders realize their full strategic value. Having advised on over 100 industry transactions, KippsDeSanto is recognized for our analytical rigor, market insight and broad industry relationships. There’s no substitute for experience. For more information, visit www.kippsdesanto.com. CLEVELAND–(BUSINESS WIRE)–Resilience Capital Partners, a private equity firm that invests in middle-market companies, announced it has acquired Concord, California-headquartered Systron Donner Inertial. As the world’s leading supplier of quartz microelectromechanical systems (QMEMS) used in inertial sensing products that provide precision guidance, navigation and locational solutions, Systron Donner develops products that have been used in everything from business aircraft to fighter jets to the MARS Rover. Systron Donner’s QMEMS technologies are used in gyroscopes, accelerometers, inertial measurement units and inertial navigation system/GPS products that provide highly precise and reliable stabilization, geo-location, guidance, navigation and flight control solutions for aerospace, marine and land vehicles and systems. Among the leading users of Systron Donner products are a leading defense contractor; a premier aerospace company; a civil and defense aerospace manufacturer; a leader in helicopter production; and a naval research agency. Systron Donner’s customers have frequently honored it for superior performance; in 2018, the firm received a leading defense contractor’s Supplier Excellence Award for the second consecutive time. The future for such sensing products is highly promising. The market for inertial navigation systems alone is projected to grow from $9.54 billion in 2017 to $12.26 billion by 2022, a compound annual growth rate of 5.15 percent, according to an analysis by the business forecasting firm ResearchAndMarkets. The continued domestic development and manufacture of products for the aerospace and defense industries is seen as vital, given fears that a decline in American technology leadership could impair national security. Recent analyses, including a whitepaper authored by experts from the Institute for National Strategic Studies and a study prepared by a team assembled by the Office of the Director of National Intelligence and the U.S. Department of Homeland Security, have underscored these concerns. An explanatory video about Systron Donner’s products is available on YouTube at https://youtu.be/6f1upekJbvE. KippsDeSanto & Co. is pleased to announce the acquisition of Thistle Design (MMC) Limited (“Thistle”) by an affiliate of our client, BEI Precision Systems & Space Company, Inc. (“BEI PSSC”), a portfolio company of J.F. Lehman & Co. Following the acquisition of BEI PSSC in April 2017, J.F. Lehman has bolted-on Thistle to complement BEI PSSC’s portfolio of optical encoders, accelerometers, optical scanners, and custom space instruments, with Thistle’s engineering and production capabilities in encoders, resolvers, and other positioning and measurement sensors. The acquisition provides BEI PSSC with an expanded, international customer base, as Thistle supports several high-profile UK land system and naval programs alongside several well-known prime contractors. Additionally, Thistle also supports numerous industrial applications for customers throughout the UK and Europe. BEI PSSC hopes to leverage its strong reputation and customer relationships within the industry to market and promote Thistle’s products in both the U.S. and internationally to create significant value. This marks BEI PSSC’s first acquisition and the Company continues to focus on both organic and inorganic growth opportunities. KippsDeSanto & Co. is an investment bank focused on delivering exceptional M&A and financing transaction results for leading aerospace, defense, and technology companies. For more information on KippsDeSanto & Co., please visit www.kippsdesanto.com. NEW YORK – BEI Precision Systems & Space Company, Inc. (“BEI PSSC”), a portfolio company of J.F. Lehman & Company (“JFLCO”), announced today the recent acquisition of Thistle Design (MMC) Limited (“Thistle”) by one of its affiliates. Headquartered in Loanhead, Scotland, Thistle is a supplier of encoders, resolvers, and other positioning and measurement sensors for the defense and industrial markets, primarily in the UK. BEI PSSC is a leader in high-accuracy positioning sensor technologies, providing advanced design, manufacturing and testing for reliable and resilient products and systems. BEI PSSC’s core product lines, which are used primarily in mission-critical defense and space applications, include optical encoder-based positioning systems, scanners for situational awareness requirements and precision accelerometers. BEI PSSC is headquartered in Maumelle, Arkansas, and has a longstanding track record of technological innovation, with corporate roots dating back to 1862. “Thistle is BEI PSSC’s first add-on acquisition and represents an important step in executing BEI PSSC’s strategy of augmenting organic development with complimentary add-on acquisitions,“ said Steve Brooks, Partner at JFLCO. “Thistle’s dedicated engineering talent, proprietary suite of products, and focus on customer service represents a strong strategic fit with BEI PSSC’s core operating principles. We are looking forward to further serving our collective customer bases with this broadened portfolio of solutions,” added Will Hanenberg, Principal at JFLCO. KippsDeSanto & Co. served as financial advisors to BEI PSSC and JFLCO and Jones Day (lead counsel) and Miller & Chevalier Chartered (international trade, government contracts and defense security compliance matters) provided legal counsel. KippsDeSanto & Co. Advises Ballard Power Systems Inc.
KippsDeSanto & Co. is pleased to announce the sale of the Power Manager business from Protonex (“Protonex”), a subsidiary of our client, Ballard Power Systems Inc. (NASDAQ: BLDP, “Ballard”) to Revision Military Ltd. (“Revision”). Protonex designs and manufactures efficient, flexible power solutions for portable, remote, and military applications. Protonex has deployed thousands of portable power solutions globally. The Company’s products include both squad-based power manager systems, which can power any gear from any battery or charge any battery from any source, as well as man-wearable products which extend uptime of mission-critical devices and provide soldiers with full-power situational awareness. In 2017, Protonex’s Squad Power Manager received signature approval for full rate production status, commonly known as “Milestone C” for the Mobile Soldier Power Program of Record. This Program of Record includes a number of new devices focused on improving power and energy management on and around the soldier, including Protonex’s Squad Power Manager Kit (SPM-622), conformal wearable batteries, and man-worn power and data distribution devices, such as Protonex’s Vest Power Manager family. Revision develops and supplies leading-edge protective equipment, including innovations in power management and integrated systems, for mission-critical military and tactical use. The addition of Protonex to the Revision platform, along with planned increases in U.S. defense spending and achievement of Milestone C, creates significant synergies and a compelling growth opportunity for the combined business. VANCOUVER, BC, CANADA and SOUTHBOROUGH, MA, USA – Ballard Power Systems (NASDAQ: BLDP; TSX: BLDP) today announced that it has entered into a definitive agreement to divest certain non-core assets of its subsidiary, Protonex, related to the Power Manager business to Revision Military Ltd. (www.revisionmilitary.com), a private U.S.-based company, for up to $16.0 million in cash. Ballard will retain certain assets related to fuel cell propulsion systems for military and commercial unmanned vehicles. Terms of the transaction include upfront consideration of $4.75 million to Ballard – payable in cash and note – subject to a customary working capital adjustment, and up to a further $11.25 million, based on achievement of specific sales objectives during a 12-month earn-out period. The transaction is expected to close within the next 60 days, subject to customary closing conditions. 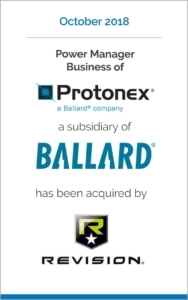 In 2015 Ballard paid approximately $17.5 million in shares and cash to acquire Protonex, which included the Power Manager business, a Solid Oxide Fuel Cells business which was divested in January 2018, and the unmanned vehicle business. For additional information regarding unmanned vehicles, please visit http://www.ballard.com/markets/uav. This release contains forward-looking statements concerning future events or developments, anticipated product performance, customer benefits and market demand for our products. These forward-looking statements reflect Ballard’s current expectations as contemplated under section 27A of the Securities Act of 1933, as amended, and Section 21E of the Securities Exchange Act of 1934, as amended. Any such forward-looking statements are based on Ballard’s assumptions relating to its financial forecasts and expectations regarding its product development efforts, manufacturing capacity, and market demand. https://kippsdesanto.com/wp-content/uploads/2018/10/Project-Spark-Protonex.jpg 1200 750 kippsdesanto /wp-content/uploads/2018/10/KDCo-Blue-Logo-300x52.png kippsdesanto2018-10-30 11:55:192019-01-02 12:03:19KippsDeSanto & Co. Advises Ballard Power Systems Inc.
KippsDeSanto & Co. is pleased to announce the sale of its client, Capewell Aerial Systems (“Capewell” or the “Company”) to Argosy Private Equity (“Argosy”). Capewell is a leading designer, manufacturer, and distributor of aerial delivery, life support, and advanced tactical products for aerospace, defense, public safety, and law enforcement customers. Capewell supports customers both domestically and internationally through a broad range of capabilities, to include design engineering, machining, life cycle support services, precision assembly, RF welding, and technical sewing. Capewell’s differentiated solutions have led to enduring positions on key programs and platforms, including the Army Air Warrior program, the C-130 aircraft, and various Boeing commercial aircraft. In-house engineering and internal R&D efforts drive new product development, resulting in a variety of proprietary solutions among Capewell’s numerous product lines. Customers depend on these proprietary products – to include parachute releases, emergency descent devices, and helicopter hooks, among others – to ensure the safe and successful execution of a wide variety of missions. About KippsDeSanto & Co. KippsDeSanto & Co. is the largest independent investment banking firm exclusively focused on serving leading, growth-oriented Aerospace / Defense, Government Services and Technology companies. We are focused on delivering exceptional M&A and Financing transaction results to our clients via leveraging our scale, creativity and industry experience. We help market leaders realize their full strategic value. Having advised on over 100 industry transactions, KippsDeSanto is recognized for our analytical rigor, market insight and broad industry relationships. There’s no substitute for experience. For more information, visit www.kippsdesanto.com. CLEVELAND, OHIO – Cleveland private equity firm CapitalWorks, LLC announced the sale of its investment in Capewell Aerial Systems (“CAS” or the Company), a designer and manufacturer of highly advanced air soldier tactical gear, search & rescue, parachute, and aerial delivery products, to Argosy Private Equity. Terms of the deal were not disclosed. After acquiring Capewell Holdings in 2014, CapitalWorks transformed Capewell from a component business to a full solution provider through its acquisition and integration of Aerial Machine and Tool. The combined company, Capewell Aerial Systems, became the world leader in innovative tactical safety products for the air warrior. “CapitalWorks added tremendous value through its network and strategy development. CapitalWorks assembled a world class advisory board and provided us with management processes that have given us an advantage over our competitors,” said John Marcaccio, CEO and President of Capewell Aerial Systems. CapitalWorks, LLC was advised on the transaction by KippsDeSanto and legal counsel was provided by Calfee, Halter, & Griswold. Ironwood Capital was a trusted financial partner. Working with Todd Martin on the transaction for CapitalWorks were Vice President, John Corrigan and Associate, Patrick Chang. Capewell Aerial Systems (http://capewellaerialsystems.com/) designs and manufactures highly advanced air soldier tactical gear, search & rescue, parachute, and aerial delivery products. CapitalWorks’ initial investment in the Company was made through its acquisition of Capewell Holdings in 2014, which was subsequently separated into two distinct operating companies (Capewell Systems and Ripley Tools). The acquisition of Aerial Machine & Tool by Capewell Systems created Capewell Aerial Systems. Ripley Tools remains a CapitalWorks portfolio company and is the leading developer and manufacturer of specialty hand tools for the fiber optic, telecom and utility industries as well as testing equipment for the fiber optic industry. CapitalWorks LLC (capitalworks.net) is a Midwestern and family-focused private equity firm that encourages knowledgeable investors to partner with it in finding, vetting and owning companies. Based in Cleveland, Ohio, CapitalWorks acquires lower middle-market companies in the niche manufacturing, value-added distribution, and business services industries and gives them the capital, support and freedom to grow. Recent acquisitions include C&M Conveyor, GEMCITY Engineering and Manufacturing, Paradigm Windows and Chemtron Corporation. Founded in 1999, CapitalWorks’ investors are primarily successful entrepreneurs and executives who contribute to the evaluation and investment process. KippsDeSanto & Co. Advises GenNx360 Capital Partners on its acquisition of Precision Aviation Group, Inc.
KippsDeSanto & Co. is pleased to announce the acquisition by its client, GenNx360 Capital Partners (“GenNx360” or the “Company”) of Precision Aviation Group, Inc. (“PAG”), a portfolio company of PNC Riverarch Capital. GenNx360 is a New York City-based private equity firm established in 2006 focused on acquiring middle market business services and industrial companies with proven and sustainable business models. Headquartered in Atlanta, GA, with nine additional locations across the globe, PAG is a leading provider of maintenance, repair, and overhaul (“MRO”) and global supply chain network solutions for fixed and rotary-wing operations across a range of diverse end markets. As the exclusive provider of its trademarked Inventory Supported Maintenance, Repair, and Overhaul (“ISMRO®”) capability focused on multi-site logistics and full lifecycle support, PAG delivers comprehensive support to varied general aviation, commercial, and military platforms. In addition, the Company maintains its status as one of only a few companies, outside of Original Equipment Manufacturers (“OEM”), to collectively hold unlimited ratings granted by the Federal Aviation Administration (“FAA”). The acquisition is expected to integrate GenNx360’s industry experience, OEM relationships, and operational expertise alongside PAG’s technical proficiency and talented management team to create new growth opportunities. The partnership allows PAG to leverage GenNx360’s resources to enhance its current suite of products and services, providing PAG with multiple avenues to pursue growth within the aviation MRO services market. Financial terms of the transaction were not disclosed. GenNx360 Capital Partners (“GenNx360”), a New York-based private equity firm which invests in middle market business services and industrial companies is pleased to announce its acquisition of Precision Aviation Group, Inc. (“PAG” or the “Company”), effective July 26, 2018. PAG, established in 1993, is a leading provider of maintenance, repair and overhaul (MRO) and supply chain solutions for fixed and rotary-wing aircrafts serving diverse end markets. Headquartered in Atlanta, Georgia, the Company operates out of nine locations in the United States, Canada, Australia, Brazil and Singapore. GenNx360 Capital Partners is a private equity firm focused on acquiring middle market business services and industrial companies. We invest in companies with proven and sustainable business models in expanding industries with the objective of implementing the required operating changes to deliver cost efficiencies, accelerate growth, and generate strong financial returns. Target industries include industrial and environmental services, packaging, food and agricultural products and services, logistics and supply chain solutions, industrial machinery and components, infrastructure equipment and services, specialty chemicals, and aerospace and defense. GenNx360 was founded in 2006 and is headquartered in New York City. For more information on GenNx360 Capital Partners, please visit www.gennx360.com. About Precision Aviation Group, Inc.
https://kippsdesanto.com/wp-content/uploads/2018/08/GenX-tombstone.png 735 460 kippsdesanto /wp-content/uploads/2018/10/KDCo-Blue-Logo-300x52.png kippsdesanto2018-07-15 12:00:372019-01-03 15:13:55KippsDeSanto & Co. Advises GenNx360 Capital Partners on its acquisition of Precision Aviation Group, Inc.
KippsDeSanto & Co. is pleased to announce the sale of our client, Germane Systems LC (“Germane” or the “Company”), to Mercury Systems, Inc. (“Mercury”). Germane is an industry-leading designer, developer, and manufacturer of rugged servers, computers, and storage systems for command, control, and information (“C2I”) applications for critical U.S. and international defense programs and platforms, as well as commercial aerospace and industrial markets. Based in Chantilly, Virginia and founded in 1997, Germane has grown to offer world-class design and manufacturing capabilities, with thousands of products deployed to customers around the globe. Germane works closely with its customers to reach the optimal balance between competing imperatives for commercial-off-the-shelf (“COTS”) and highly customizable rugged computer solutions. Germane’s products are designed to provide enhanced reliability and availability demanded by mission-critical applications in harsh environments. Since inception, Germane has deployed tens of thousands of units across multiple domains and industries, serving key industry clients in the aerospace and defense sectors. Germane has had an entrenched position on the technology insertion (“TI”) program for the naval subsurface fleet for over a decade and is also a supplier to a number of airborne platforms. The acquisition of Germane, coupled with Mercury’s acquisition of Themis Computer in February 2018, creates a $100+ million C2I rugged server business for Mercury that will enhance its market penetration in the broader command, control, communications, computers, and intelligence (“C4I”) market and provide additional capabilities for its customers. The combination with Themis also provides Mercury with key positions across air, land, and sea (surface and subsurface) defense platforms – through Themis’ naval surface fleet footprint and army platforms (WIN-T / JLTV) and Germane’s footprint on the naval subsurface fleet and airborne platforms. Mercury Systems said Tuesday it has acquired Chantilly, Virginia-based rugged server maker Germane Systems for $45 million to further grow the portfolio of computers and storage systems for U.S. and international defense programs. The deal comes nearly six months after Mercury closed its $180 million purchase of another rugged server company in Themis Computing. Mercury said it will combine Themis with Germane to create a business line of at least $100 million in annual revenue in rugged servers for command, control and information applications, Mercury said. During Mercury’s fourth quarter and fiscal year-end earnings call Tuesday, CEO Mark Aslett said the company made both deals to enter different parts of the rugged server market. Investment bank KippsDeSanto advised Germane on the transaction with Mercury. Andover, Massachusetts-based Mercury has been among the most active buyers over the past three years in a busy period for federal market merger-and-acquisition activity. Including Germane and Themis, Mercury has put $620 million toward acquisitions of seven companies in the past 31 months to become a more formidable player in mission computing and C4I technologies — command, control, communications, computers and intelligence. Mercury saw Themis in particular as a platform from which to make more acquisitions, Aslett said on the call. That run of acquisitions has positioned Mercury to push past the $600 million-revenue mark for its current fiscal year 2019 started in July, the company said its year-end financial statement. Including Germane, Mercury expects sales of $602 million-$624 million for FY 2019. The company reported FY 2018 sales of $493.2 million compared to $408.6 million for FY 2017. KippsDeSanto & Co. is pleased to announce the sale of our client, Aitech Rugged Group (“Aitech” or the “Company”) to FIMI Opportunity Funds (“FIMI”). Aitech is a leading supplier of rugged, hi-tech embedded computers for mission-critical aerospace, defense, and space programs worldwide optimized for harsh environments, in support of leading defense industry prime contractors and major global aerospace platform integrators. Headquartered in Chatsworth, California, with operations in Herzliya, Israel, Aitech has established a reputation as a go-to supplier for advanced, high-performance, aerospace, defense, and space-qualified embedded computing and custom Commercial Off-The-Shelf Products (“COTS”) products used for Command, Control, Communications, Computers, Intelligence, Surveillance and Reconnaissance (“C4ISR”) and signal and sensor processing. Aitech’s industry-leading engineering capabilities combine advanced, customized COTS, custom hardware, and software to provide integrated systems to meet evolving customer needs and mission requirements. The Company’s unique customization model positions Aitech and its customers with the ability to continuously stay at the leading-edge of technological advancement, significantly reducing risk, time-to-market, and obsolescence for highly-visible, mission-critical programs. The acquisition of Aitech provides FIMI with a well-established defense electronics platform and global customer base. FIMI intends to make an immediate internal investment into Aitech to enable the Company to capitalize on increasing demand for its products and create a highly-scalable, market-dominant rugged embedded computing solutions provider. The acquisition represents another step in FIMI’s plan to make investments in non-Israeli companies and centralize their operations in Israel. Aitech represents the fourth investment made by FIMI since November 2017 in a series of defense electronics / satellite businesses. FIMI plans to grow the Company’s business with a focus on business development, research, and sales and marketing initiatives. Israel-based private equity firm FIMI Opportunity Funds is acquiring defense electronics company Aitech Rugged Group Inc. for $30 million, the firm announced Thursday. Part of the sum will be used to buy Aitech from its current owners, a group of Netherlands-based investors, and the rest will be infused into the company to promote operational growth, the firm said in a statement. Headquartered in Chatsworth, California, Aitech develops and manufactures commercial and military embedded computing solutions for the military and space industries. The company has several subsidiaries, including Aitech Systems Ltd., located in Tel Aviv suburb Herzliya, which employs 70 people out of Aitech’s 170 employees. The company reports annual revenues of $30 million-$40 million a year, and lists the Boeing Company and Lockheed Martin as customers. In November 2017, Fimi acquired a controlling stake in Israel-based ORBIT Communication Systems Ltd., a company developing and manufacturing satellite communication systems, in Israel-based satellite imaging services company ImageSat International N.V., and in Israel-based Gilat Satellite Networks Ltd.
Fimi intends to support Aitech in both the financial and the administrative aspects, to bring the company’s full growth potential to fruition, said Fimi senior partner Gillon Beck, who led the acquisition, in a statement. The acquisition is another step in Fimi’s plan to make investments in non-Israeli companies and centralize their operations in Israel, Mr. Beck explained, adding that Fimi intends to unify Aitech’s various branches and relocate the center of its administration to Israel. Aitech expects to see a significant increase in the scope of its operations in the next few years, CEO Moshe Tal said in a statement. KippsDeSanto & Co. is pleased to announce the sale of our client, Themis Computer (“Themis” or the “Company”) to Mercury Systems, Inc. (“Mercury”). Themis is an industry leading designer, developer, and manufacturer of environmentally-resilient computing solutions that integrate the latest commercial technologies and minimize size, weight, and power (“SWaP”) for critical U.S. and international aerospace and defense programs. Based in Fremont, California, Themis has established a reputation as a trusted provider of high-performance aerospace and defense electronics for mission-critical platforms. Over the past 20 years, the Company has demonstrated its ability to be at the forefront of market shifts and rapidly adapt to evolving customer needs. Through continuous advancement of innovative, dependable, and durable products, Themis has entrenched itself in key aerospace and defense programs. The Company works with end customers to define and develop comprehensive solutions that address the customer’s exacting requirements for ruggedness and SWaP. Themis’ past performance, deep customer relationships, and strong domain knowledge have enabled the Company to deliver the next generation of high-end, ruggedized computing solutions for mission-critical U.S. Army, Navy, and broader Department of Defense (“DoD”) applications. The acquisition of Themis provides Mercury with a platform to further penetrate the Command, Control, Communications, Computers, and Intelligence (“C4I”) market and expand Mercury’s capabilities in rugged servers and tactical cloud computing solutions. Themis also broadens Mercury’s presence on some of the largest U.S. Navy and Army server programs in the U.S. DoD, including the Navy’s Common Display System and Common Processing System for the Aegis Weapon System, and Army’s Joint Light Tactical Vehicle (“JLTV”) and Warfighter Information Network – Tactical (“WIN-T”). By supporting well-funded, decades-long aerospace and defense programs, Themis has developed a reputation for quality and is well-positioned for continued growth as the Company leverages Mercury’s capabilities to offer new products and solutions to its customers. ANDOVER, Mass., Dec. 21, 2017 (GLOBE NEWSWIRE) — Mercury Systems, Inc. (NASDAQ:MRCY) (www.mrcy.com) today announced that it has signed a definitive agreement to acquire Themis Computer (Themis). Based in Fremont, Calif., Themis is a leading designer, manufacturer and integrator of commercial, SWaP-optimized rugged servers, computers and storage systems for U.S. and international defense programs. Pursuant to the terms of the agreement, Mercury will acquire Themis for an all cash purchase price of $180 million, subject to net working capital and net debt adjustments. The acquisition and associated transaction expenses are expected to be funded through Mercury’s existing revolving credit facility. Themis is on a rapid growth trajectory supported by a number of key design wins that are transitioning to production, and is currently expected to generate revenue of approximately $57 million for its fiscal year ending December 31, 2017 with adjusted EBITDA margins of approximately 23%. The acquisition is expected to be immediately accretive to adjusted EPS. “In summary, Themis is a strategic platform acquisition that will enable us to continue penetrating the C4I market and provide important new capabilities for our customers. We look forward to the Themis team becoming part of the Mercury family,” Aslett concluded. The acquisition is subject to customary closing conditions, including approval pursuant to the Hart-Scott-Rodino Antitrust Improvements Act of 1976. The transaction is currently expected to close during Mercury’s fiscal 2018 third quarter ending March 31, 2018. For more information, visit www.mrcy.com/acquisition or contact Mercury at (866) 627-6951 or info@mrcy.com. Located in heart of Silicon Valley, at Fremont, California, Themis builds environmentally resilient computing solutions that integrate the latest commercial technologies and minimize size, weight and power (SWaP) for mission critical applications. Dedicated to providing reliable high performance computing platforms for military, aerospace, energy, and rugged commercial use; our products meet or exceed industry requirements, integrate the latest key technologies, and are proven to perform reliably under stress and in extreme environments. For more information, visit www.themis.com. Mercury Systems (NASDAQ:MRCY) is a leading commercial provider of secure sensor and safety-critical processing subsystems. Optimized for customer and mission success, Mercury’s solutions power a wide variety of critical defense and intelligence programs. Headquartered in Andover, Mass., Mercury is pioneering a next-generation defense electronics business model specifically designed to meet the industry’s current and emerging technology needs. To learn more, visit www.mrcy.com. This press release contains certain forward-looking statements, as that term is defined in the Private Securities Litigation Reform Act of 1995, including those relating to the acquisition described herein. You can identify these statements by the use of the words “may,” “will,” “could,” “should,” “would,” “plans,” “expects,” “anticipates,” “continue,” “estimate,” “project,” “intend,” “likely,” “forecast,” “probable,” “potential,” and similar expressions. These forward-looking statements involve risks and uncertainties that could cause actual results to differ materially from those projected or anticipated. Such risks and uncertainties include, but are not limited to, continued funding of defense programs, the timing and amounts of such funding, general economic and business conditions, including unforeseen weakness in the Company’s markets, effects of continued geopolitical unrest and regional conflicts, competition, changes in technology and methods of marketing, delays in completing engineering and manufacturing programs, changes in customer order patterns, changes in product mix, continued success in technological advances and delivering technological innovations, changes in, or in the U.S. Government’s interpretation of, federal export control or procurement rules and regulations, market acceptance of the Company’s products, shortages in components, production delays or unanticipated expenses due to performance quality issues with outsourced components, inability to fully realize the expected benefits from acquisitions and restructurings, or delays in realizing such benefits, challenges in integrating acquired businesses and achieving anticipated synergies, increases in interest rates, changes to cyber-security regulations and requirements, increases in tax rates, changes to generally accepted accounting principles, difficulties in retaining key employees and customers, unanticipated costs under fixed-price service and system integration engagements, and various other factors beyond our control. These risks and uncertainties also include such additional risk factors as are discussed in the Company’s filings with the U.S. Securities and Exchange Commission, including its Annual Report on Form 10-K for the fiscal year ended June 30, 2017. The Company cautions readers not to place undue reliance upon any such forward-looking statements, which speak only as of the date made. The Company undertakes no obligation to update any forward-looking statement to reflect events or circumstances after the date on which such statement is made. Mercury Systems and Innovation That Matters are trademarks of Mercury Systems, Inc. Other product and company names mentioned may be trademarks and/or registered trademarks of their respective holders. KippsDeSanto & Co. Advises BTP Systems, LLC on its Sale to Serco Inc.
KippsDeSanto & Co. is pleased to announce the sale of BTP Systems, LLC (“BTP” or the “Company”) to Serco Inc (“Serco”). BTP is a leading provider of design, engineering, manufacture, and sustainment of mission-critical satellite communications (“SATCOM”) terminals, radar systems, and other complex communications hardware, in support of the U.S. Navy, U.S. Air Force, and leading defense industry prime contractors. Headquartered in Ludlow, MA, BTP offers a comprehensive suite of full lifecycle, end-to-end system capabilities, including systems engineering, design, prototype development, integration, testing, manufacturing, depot-level repair, and obsolescence engineering support, with expertise across shipboard and submarine SATCOM and MILSTAR terminals and antenna systems. BTP operates one of the largest and most advanced near-field antennae ranges in the country, which, in addition to its compact antenna range, enables it to support a wide range of unique testing requirements. With more than a decade of experience supporting nearly every Naval extremely high-frequency (“EHF”) and super high-frequency (“SHF”) SATCOM antenna system, such as SubHDR and Multiband Terminal, BTP has amassed considerable domain knowledge and expertise and has established a long-standing reputation in the industry as the go-to provider of complex technical SATCOM services. The acquisition of BTP aligns well with Serco’s strategic growth objectives to expand capabilities and customer reach as BTP brings Serco critical new capabilities and additional U.S. defense customers. In addition, Serco believes that the addition of BTP will position the combined company to take better advantage of the current demand for sustainment, overhaul, and testing services in the U.S. SATCOM marketplace. Buyers continue to place premium values on companies with entrenched and defensible positions with key customers on mission-critical programs. RESTON, VIRGINIA – October 24, 2017 – Serco Inc., a provider of professional, technology, and management services, announced today that the Company has entered into a definitive agreement to acquire BTP Systems, LLC (“BTP”), headquartered in Ludlow, MA with operations or personnel in Newport RI, Reno NV, San Diego CA, Charleston SC, Groton CT, Norfolk, VA, Chesapeake VA, and Mayport FL. The acquisition, subject to required approvals, is expected to close by the end of this year. The proposed acquisition would support Serco’s strategic growth plan in the defense sector by enhancing its portfolio of Command, Control, Communications, Computers, Combat Systems, Intelligence, Surveillance and Reconnaissance (C5ISR) service offerings and broadening its Federal government client base. BTP provides satellite communications (SATCOM), radar modernization, operations and maintenance, and sustainment services that enable customers to extend the lives of existing systems and achieve phased upgrades with new technology to enhance operational capability. BTP specializes in areas including obsolescence engineering, systems engineering services, test equipment and design, and field engineering services, and maintains a near-field and compact antenna test range at their Ludlow, MA headquarters. The company’s expertise spans shipboard and submarine SATCOM antenna systems, MILSTAR command post antennas, and radar antennas. “BTP Systems is an excellent addition to our rapidly growing C5ISR business supporting naval modernization and sustainment for ship, shore, and hardware integration projects,” said Dave Dacquino, Chairman and CEO of Serco Inc. “This acquisition will provide Serco with capabilities in the engineering, overhaul, repair, and sustainment of SATCOM and radar systems that expand our scope of solutions for existing customers and brings Serco to new customers including Hill Air Force Base, the Naval Undersea Warfare Center, and Naval Air Systems Command. The demand for sustainment, overhaul, and testing services is growing rapidly as many of the SATCOM and radar systems both on ships and on shore require significant upgrades and maintenance to extend their useful lives. BTP supports major SATCOM integrators with specialized RF engineering, small lot production, and RF testing services. Serco’s expertise in systems integration and large-scale modernization projects helps customers achieve goals for operational enhancement and timely and cost-effective completion with a high level of confidence. Serco Inc. is a leading provider of professional, technology, and management services. We advise, design, integrate, and deliver solutions that transform how clients achieve their missions. Our customer-first approach, robust portfolio of services, and global experience enable us to respond with solutions that achieve outcomes with value. Headquartered in Reston, Virginia, Serco Inc. has approximately 8,000 employees and annual revenue of $1 billion. Serco Inc. is a wholly-owned subsidiary of Serco Group plc, a $5 billion international business that helps transform government and public services around the world. More information about Serco Inc. can be found at www.serco-na.com. https://kippsdesanto.com/wp-content/uploads/2018/03/Medium-KippsDeSanto-Tombstone-BTP.jpg 600 375 kippsdesanto /wp-content/uploads/2018/10/KDCo-Blue-Logo-300x52.png kippsdesanto2018-01-05 09:32:532019-01-02 12:03:20KippsDeSanto & Co. Advises BTP Systems, LLC on its Sale to Serco Inc.
KippsDeSanto & Co. is pleased to announce the sale of Avenge, Inc. to MAG Aerospace, supported by Clairvest Group, Inc.
Headquartered in Sterling, VA, Avenge provides flight operations and training services to U.S. government and commercial customers, including the U.S. Army and U.S. Special Operations Command (“SOCOM”). Through its team of highly-trained and experienced pilots, flight operations managers, and aviation professionals, Avenge conducts global missions in support of high-priority Intelligence, Surveillance, and Reconnaissance (“ISR”) and Reconnaissance, Surveillance, Targeting, and Acquisition (“RSTA”) operations. The Company’s core focus on delivering ISR and RSTA mission support is complemented by its expertise in pilot and maintenance training, as well as engineering, technical support, and logistics. Since its founding in 1999, Avenge has leveraged its industry-wide relationships with key mission-focused leaders to provide quality support to DoD customers across the globe. Serving both CONUS and OCONUS operations, Avenge has supported ISR missions in South America, the Middle East, Africa, and the Mediterranean. Woodbridge, Virginia – November 1, 2017 – MAG Aerospace (MAG) has acquired Avenge, Incorporated (Avenge). This acquisition adds over 100 aviation specialists, system operators, and flight operations management professionals to MAG, enhancing MAG’s already robust Manned ISR Operations and Training capabilities. Avenge, founded in 1999, is a Sterling, Virginia-based, veteran-owned aerospace company specializing in Manned ISR (Intelligence, Surveillance, Reconnaissance) Operations and Training. Avenge has amassed over 400,000 hours of fixed-wing ISR operations experience and also offers pilot and sensor operator flight training for US military personnel and foreign partners. MAG Aerospace, headquartered in Woodbridge, Virginia, is a leader in providing and enabling real-time situational awareness to help its customers to make the world smaller and safer. Private equity backed by the Clairvest Group, MAG Aerospace delivers full-spectrum ISR Services (operations, training, and technical services) and other specialty aviation to federal, international, civilian, and commercial customers around the world. In 2016, MAG’s team of 900+ professionals operated 140+ manned and unmanned special mission aircraft during more than 68,000 flight hours on 5 continents in support of our customers’ missions. For more information, visit www.magaero.com.